FIDEIt didn’t end well for Anand. At the World Chess Championship, Magnus Carlsen won Game 2 on Sunday — and he did it in convincing fashion. For Vishy Anand, the challenger, the loss is a flashback to his nightmare last year, when unsteady play doomed him in 10 games. The loss was also a huge missed opportunity. I don’t want to get you bogged down in the technical and theoretical aspects of general opening concepts for Game 2; you can read my recap of Game 1, which lays out the basics and as it turns out, predicted some of the action in Game 2. Playing white, Magnus opened with e4, moving the pawn in front of his king two spaces forward. 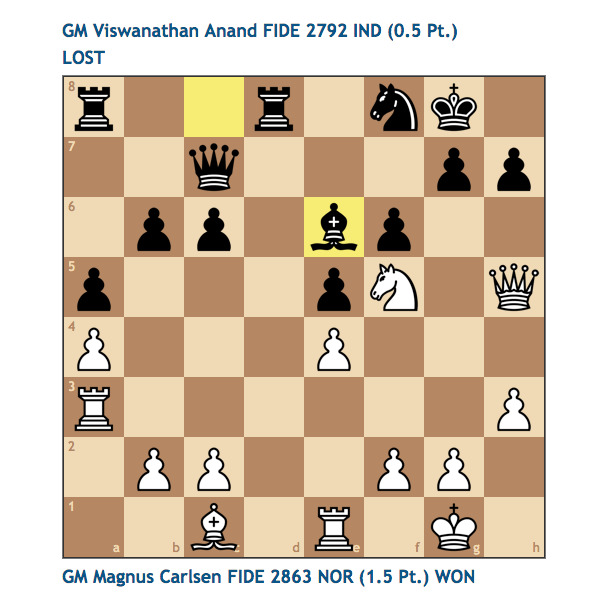 Anand countered with e5, Carlsen attacked Anand’s pawn by moving his knight to f3, Anand defended by moving his knight to c6, and then Magnus put his light-squared bishop on b5. This opening, called the Ruy Lopez or “Spanish” game, is one of premier weapons in the arsenal of modern Grandmasters. The idea is that white can attack the defending knight on c6, weakening black’s pawn on e5. If white captures the knight, black will recapture with a pawn, two minor pieces will have come off the board, and white will be better long-term because black has “doubled” pawns on the c-file — a disadvantage. The game for white is then to trade off all the pieces — bishops, knights, rooks, queens — and exploit that weakness in the endgame, hours later. Although there are other choices, as we’ll see. Chess.comBishop to b5 is the characteristic move by white in the Ruy Lopez. Anand could have attacked the bishop by moving his a-pawn one space, a manoeuvre known as the “Morphy Defence,” after the great 19th-century American player Paul Morphy. This demands that white make an immediate decision, to capture the knight or retreat the bishop. Personally, I like this move as black in the Ruy Lopez — I don’t like to fool around with the bishop threat. Instead, Anand did what Grandmasters now routinely do against the Ruy Lopez: he played his second knight to f6 and set up the Berlin Defence, which I outlined after Game 1. At the top level of chess, the “Berlin Wall” is considered an excellent drawing opening for black against the Ruy Lopez. 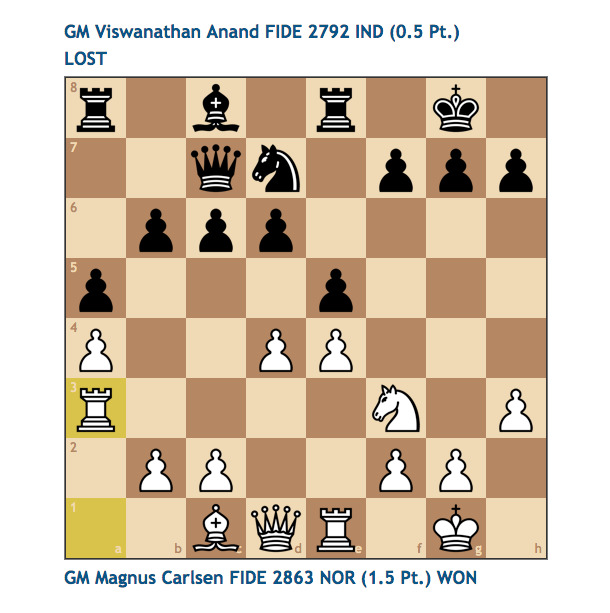 Chess.comBy bringing his knight to f6, Anand entered the Berlin Defence. FIDEThis is what the Ruy Lopez/Berlin Defence looked like in the game. That said, Anand lost a game in the Berlin in 2013, and now he’s lost another one. 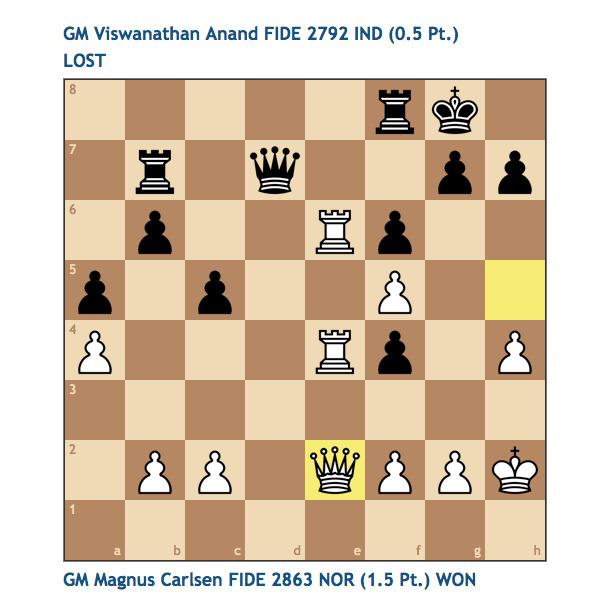 Carlsen basically destroyed Anand’s attempt to keep the match level through Game 2 with a second draw. And he did it with dynamic, attacking chess as Anand showed no ability to stop the charge. A lot of people think Magnus is a boring player who just likes to get to tough endgames and grind his opponents down. But with this beautiful Ruy Lopez refutation of the Berlin, he looked like Bobby Fischer, one of the greatest Spanish game players who ever lived. Even though Anand made mistakes and helped Carlsen out, this is one of those games that will be studied by GMs who want to rehabilitate 1. e4 and break the Berlin’s imposing reputation — its lock, really, on top-tier competition. So let’s back up. 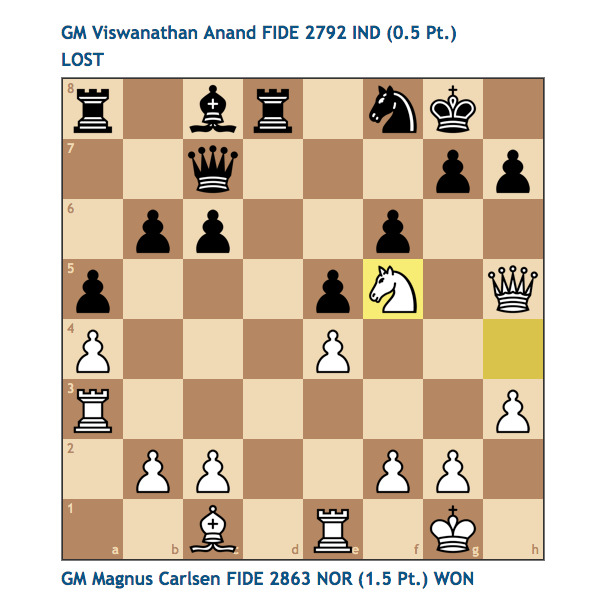 After Game 1, I said Anand needed to go for wins with white and black. The five-time World Champion isn’t going to listen to me and shouldn’t, but honestly I think he blew a golden opportunity, after Carlsen played 1. e4, to announce that he wasn’t going to go for safe draws as black but was instead going to aim for an early lead. 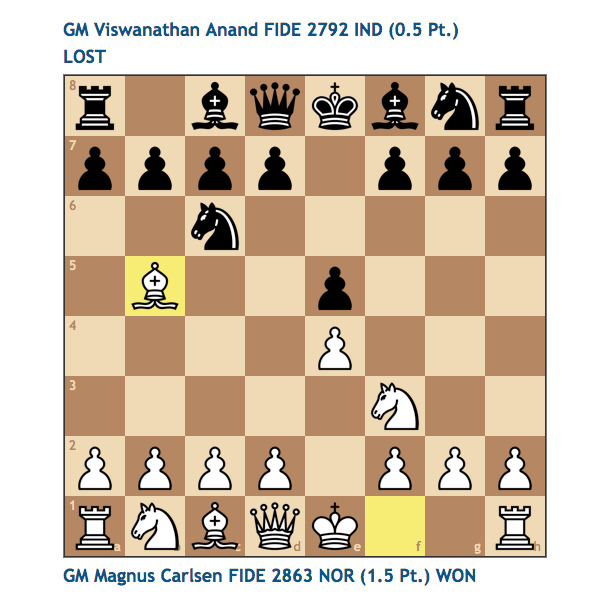 Anand is 44 and Carlsen is 23. Anand needs to front-run to have any chance in this rematch. 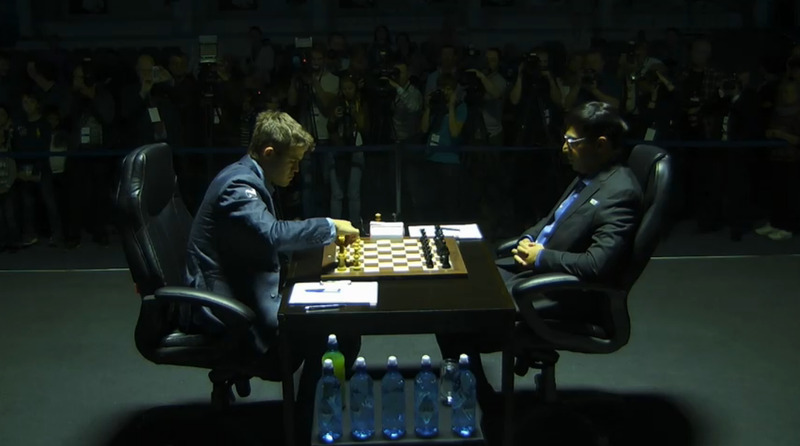 Now, with a 12-game match and Carlsen already up a full point, Anand has to come up with something impressive. Rather than setting up the Berlin, Anand could have played 1….c5 and brought to bear the most popular winning response to white’s 1. e4: the Sicilian Defence. Anand lost and lost badly in the Berlin when he was clearly aiming for a draw. He could have lost in the Sicilian, but at least he would have gone down swinging, and besides, he likes to play one of the coolest variations of the Sicilian in GM play, the Najdorf, named for Miguel Najdorf, who was a top player in the mid-20th century. If you want to learn more about these openings, which are ancient and hugely complex, you can check out various online videos and opening-explorers at websites like Chess.com. All you need to know for the purposes of the WCC this year is that Anand made a very conservative decision in Game 2 and Carlsen punished him for it. Anand’s judgment might have made sense if he were the title holder, but he’s the challenger and on paper, still the better attacking player. OK, maybe he had a match strategy that said he should get through a few games with draws and then try for wins with white, only rolling out the more aggressive openings as black if he got into trouble. But that was his strategy in 2013 and it blew up in his face: by the time he finally got around to playing the Sicilian, it was Game 10 and he had to win. What’s great about the Sicilian is that black creates straightaway an unbalanced position on the board and can turn the game into a race of attack versus attack, with both white and black having to attack and defend at more or less the same time. My son plays junior chess and loves it because it freaks out 1. e4 players, of which there are many at his level. Heck, it freaks me out — I have a very hard time getting used to the “asymmetrical” look of 1. e4 c5 on the board. Anyway, after Game 1, Anand looked very resourceful, his mind focused, playing great chess when he needed it. In Game 2, he looked like he was afraid to win, opting for defensive moves when he could have messed with Carlsen’s plan. There were really three critical moments in the game, which lasted 35 moves and was over before the end of the first two-hour time control. The first came when Carlsen showed right away that he was planning to attack Anand and attack hard with pretty much everything he had: Carlsen moved his rook from the a1 square to the a3 square, with the goal of bringing it across the board and into the assault on Anand’s castled king. There was nothing subtle about this — it was cave-man chess. Carlsen was saying, “I’m going to mass my army on the right side of the board, pulverize your barricade, and checkmate your king.” He is a Viking, after all. In this case, he was acting like Thor plus the Hulk, hammering and smashing. 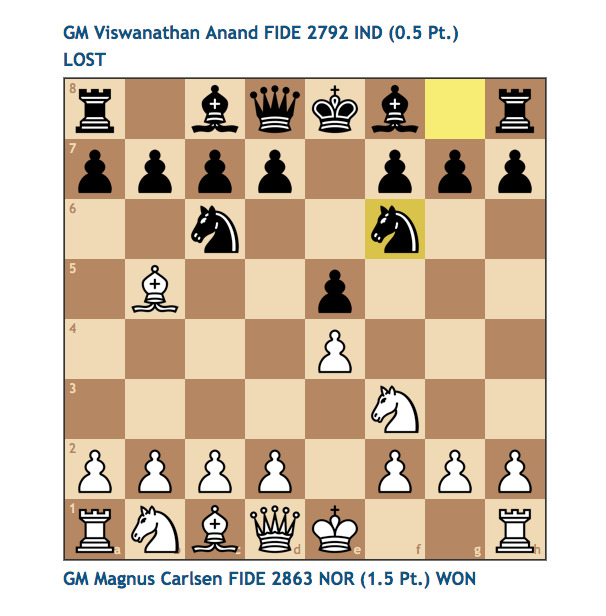 Chess.comThis ‘rook lift’ should have shown Anand that Carlsen meant to attack with brute force. 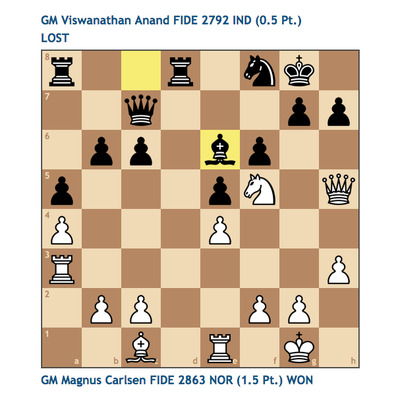 Anand couldn’t stop Carlsen from doing this but at the very least he should have noticed a obvious effort to bust the Berlin Defence by brute force. 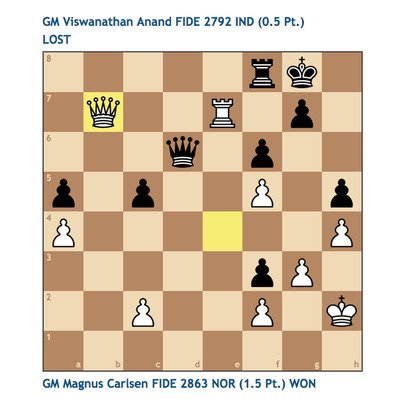 The second came when Carlsen offered to trade his second knight for Anand’s bishop and Anand passed on the opportunity. GM Peter Svidler, commenting for the official broadcast, questioned this decision…and didn’t question it: he said that he would have immediately taken the knight, but when Anand didn’t, he suggested that Anand’s idea was to make Carlsen prove that there was checkmate in the position. As it turned out, a few hours later, Carlsen did prove that. The third was really more a catastrophe than a critical moment: Carlsen was able to line up his queen and both of his rooks on the same file. This is not what anyone playing black wants to see. It’s like staring down the barrel of a howitzer and is very psychologically unnerving even if it doesn’t lead to a win. Chess.comThis looks very bad for black. The board belonged to white. 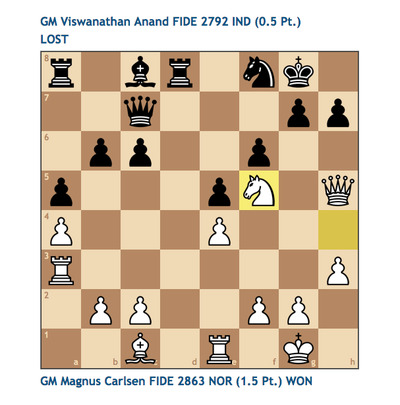 Anand wasn’t doing anything, the Berlin Wall — which is supposed to make white expend himself by trying to crash through granite — was falling, and Vishy’s only real counter-attacking options hinged on trading queens and one of his rooks to arrive at what would be very hard endgame with only rooks and pawns. Carlsen broke through by putting a rook on e7, and when he got his queen to b7 after what the major-league chess analysts are calling a massive blunder by Anand, it was crushing and Anand resigned. Anand has to be in agony now. He hasn’t beaten Carlsen for some time and has lost twice to him in what’s supposed to be the most impervious defence for black in GM chess. He went for a draw, misplayed it, and was sort of embarrassed. Maybe more than sort of. 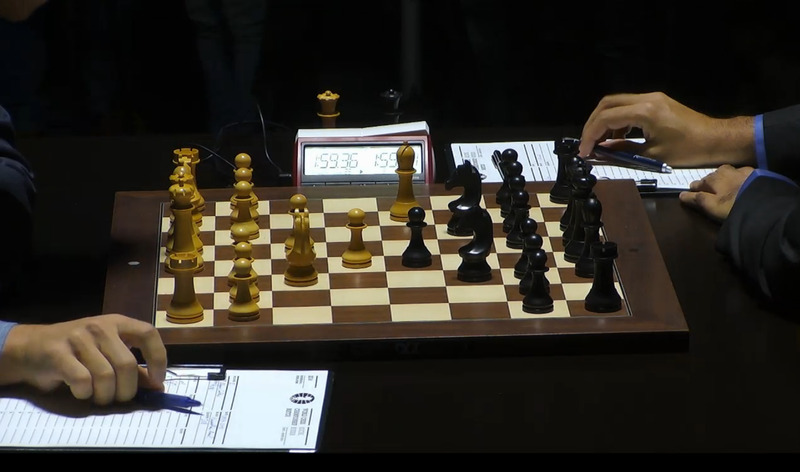 On the plus side, we certainly haven’t seen any boring Grandmaster draws in this match so far! Game 1 was the very definition of a fighting draw, and in Game 2 Carlsen continued to prove that with a big enough stick or if you aren’t intimidated, the Berlin can be broken. So looking forward to Game 3, Anand is going to have to do something aggressive with the white pieces to get back into the match. It wouldn’t surprise me if we see something wild, perhaps even a King’s Gambit, which can lead to swashbuckling games almost never seen at the GM level these days. And if Anand plays the Berlin again as black, I’ll be shocked. Bring on the Sicilian! You can watch the replay of Game 2 at the official site here. And you can replay the game at ChessBase, with terrific commentary by GM Alejandro Ramirez.